The (handheld) Oscilloscope PKT 1220 is a combination of a digital oscilloscope with 1-channel memory and TRMS multimeter. 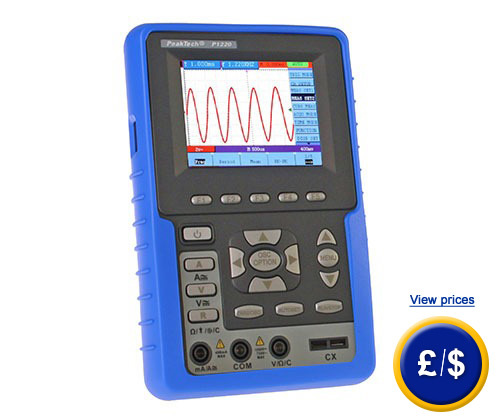 This handheld Oscilloscope PKT 1220 is the ideal solution for many applications. Its creative and simplified design makes this device easy to handle, and the TFT colour 3.8" display (resolution: 320 x 240 pixels and 65,535 colours) can display the curves easily. To allow mobile work, the handheld Oscilloscope-PKT 1220 has a lithium-ion battery, which ensures a continuous operation thanks to its long battery life. Thus, this device is ideal for measurements in the workplace or on site. Due to the automatic range adjustment and an automatic configuration, you can work with the handheld oscilloscope quickly and safely. The measurement values can be transmitted to PC via USB port. The integrated meter has all the standard functions and is also equipped to measure capacity. If you have any questions about the handheld oscilloscope, see the techncial data below or contact us: UK customers +44(0) 23 809 870 30 / US customers +1-410-387-7703. Our engineers and technicians will advice you on the handheld oscilloscope or any other product on the field of regulation and control, measuring instruments and scales or balances. 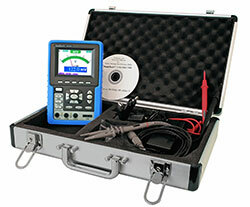 The handheld oscilloscope is delivered with a case so the equipment and accessories are well kept. This case will make transportation easier. Therefore, this handheld oscilloscope is ideal for mobile work. As the handheld oscilloscope offers multiple functions, you do not have to use different equipment, this device will be enough. For continuous measurements, the handheld oscilloscope can be powered through network component. For mobile work, the handheld oscilloscope has a lithium-ion battery.